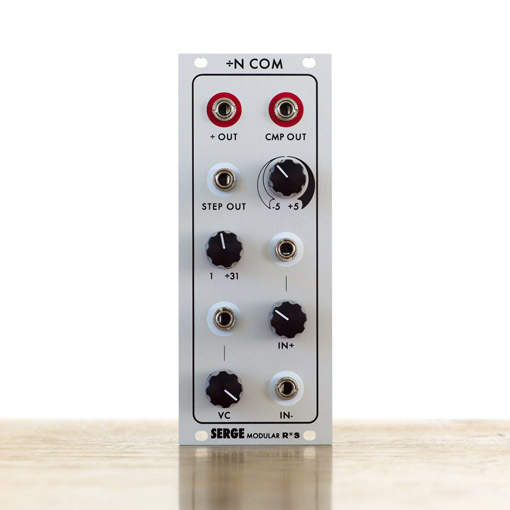 Hi, I've been craving for some time a ÷N COM and wanted to know if Ken Stone's Voltage Controlled Divider is a) the same circuit; b) could be used to perform like a ÷N COM. I guess, to match the R*S design, the CV IN jack should not be connected to +15v, but instead the +15v should be mixed through an attenuator with the CV IN voltage. What I don't understand much is the comparator section... (WAIT, is there really one that could work with a range of input voltages????) Does the MOUT in CGS design act as the comparator output?? If so, does the CMP pot act as the -5/+5 comparator level pot on R*S module? Same goes for the M-IN... is that the negative input for the comparator? Well, I guess the MOUT is definitely not similar to the comparator output in the ÷N COM... is there some way to get something similar out of the CGS design? Or is the comparator there just used to get a square wave out of the input to drive the rest of the module? VC and IN+ pots are indeed attenuators to +15V. Oh, thanks for that link. That really clears some things up. I'll try making a build with the comp out wired to MOUT then. And for the 6k8 resistors, I'll be using 5k6... the math for a 12v power supply gives 5.44k so I guess 5k6 will be fine, or the closest 1% value.